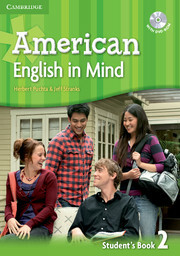 American English in Mind Level 2 Student's Book with DVD-ROM features 16 units. Thought-provoking reading, listening, speaking, and writing topics motivate teenage students of American English. Content-rich photostories and dialogues present contemporary spoken American English in realistic contexts. 'Culture in mind' sections give insight into different aspects of English-speaking life. 'Check your progress' sections help students monitor their learning. The DVD-ROM features stimulating grammar exercises, games, video, unit tests, Workbook audio, and selected Student's Book audio. The videos feature the photostory characters and include 'Videoke,' which allows students to record and hear their voices in portions of the video dialogues.